The Ural River is a river in the European country of Russia. It is 1,509 miles (2,428 kilometers) long. It is generally considered to be the border between the continents of Europe and Asia. The river flows from the Ural Mountains to the Caspian Sea and is the third longest river in Europe. 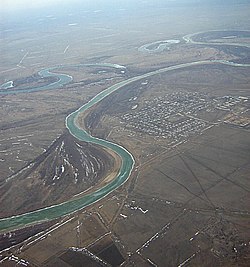 Some of the large cities the river runs through are Orsk and Uralsk. Wikimedia Commons has media related to Ural River. This page was last changed on 16 June 2018, at 00:41.